In a rather clever use of augmented reality, Burger King is using it so customers can virtually “burn” the ads of its competitors. Using an AR feature in the Burger King app, consumers in Brazil can aim their phone at the ad of a competitor. The ad being viewed through the phone camera then appears to totally burn up, being replaced by an ad for a Burger King Whopper, as detailed in a company video. 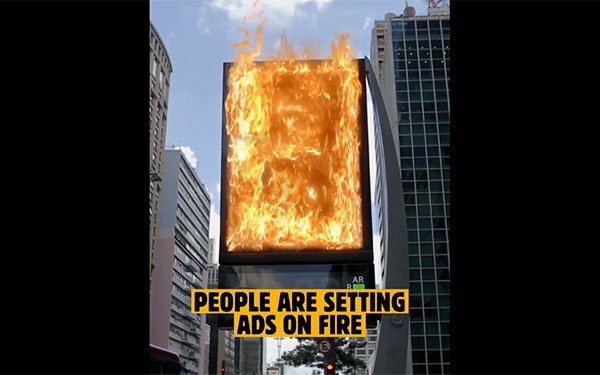 The “Burn That Ad” campaign, created by David Sao Paulo, then provides a screen letting the consumer know they can then receive a free Whopper at the nearest Burger King. “Technology as a means to provide the best customer experience is one of our main investment targets in 2019,” said Ariel Grunkraut, Burger King's marketing and sales director for Brazil in a statement. Creative uses of augmented reality are becoming limitless.